The Sunshine Space: The hot-shot I was not. When I was an eighth-grader, I received the devastating news that my family would be moving from the city I grew up in. Although heart-broken, I processed my feelings and decided I still wanted to try out for the freshman cheer squad at my new high school (as I'd been planning to at the high school I thought I'd attend). My mom and I traveled to the suburbs of Austin, TX for me to attend the clinic and try-outs. It was nerve-racking and exhilarating and scary to go through that process with a bunch of girls I had never met. I got up the gumption to introduce myself to a few people and practically invited myself to practice with them at one of their houses. I was confident going into try-outs and performed really well. I was so thrilled to see my name on the list when the new squad was posted. Everything was going to be okay! I had a few friends! My high school plans were not totally shot! Imagine my dismay when the plans changed and I found out we weren't going to end up near Austin after all. . . but in SAN ANTONIO. I was angry. I was disappointed. I was frustrated. I was overwhelmed. Would I have to gather all the courage I had left in me and do cheer try-outs again? It was too daunting of a thought. To my great disappointment and utter relief, cheerleading try-outs at Reagan (my high school) had already passed by the time my family figured out where we were actually going to live. I spent my freshman year starring in the pep squad (a group of girls devoted mostly to preparing for drill and dance teams). I was so bitter and sad, but luckily I made friends and it didn't turn out as horribly as I imagined it would. At the end of my freshman year, I finally had the opportunity to try out for cheerleading again. That year had felt so long. I was pleased and excited when I made the JV squad. I loved cheerleading. I loved learning new chants and cheers. I loved the excitement of football games. I loved motivating a crowd to get on their feet. I loved increasing school spirit. I loved jumping. I loved expressing enthusiasm with facial expressions. I loved the quick, sharp movements of the dances. I loved stunting. But I did not love tumbling (this loathing could have very well been, in part, because I wasn't good at it). I spent so much time trying to get my body to flip over backwards. So. much. time. But that back tuck never really came to me. Not to mention, after years of tumbling, I was still scared out of my mind to do a single back handspring. It was infuriating. . . and because of my sub-par tumbling skills, I always felt a little bit "less than" the rest of the girls on the squad. It was damaging to my self-esteem and, if I'm honest, to my self-worth at the time too. When I didn't make the cut at the end of my sophomore year, I was devastated, but not surprised. I knew I couldn't be competitive in the cheerleading world. It was a silver lining in that situation to have my best friend, Ashley, go through the same heartbreak. Together with our friends from pep squad, we tried out for the drill team. We both made it, which was a big reprieve, seeing as I don't know if we could've handled double rejection. Bah! We had a really fun junior year and, with the hindsight only time can give me, I know it all worked out for a reason. Needless to say, I was not a hot-shot. Ha! (JD says I'm a long-winded story-teller. Like, I just gave all that background info, but I really just wanted to get across that I wasn't a hot-shot. Sorry! I like detailed stories). 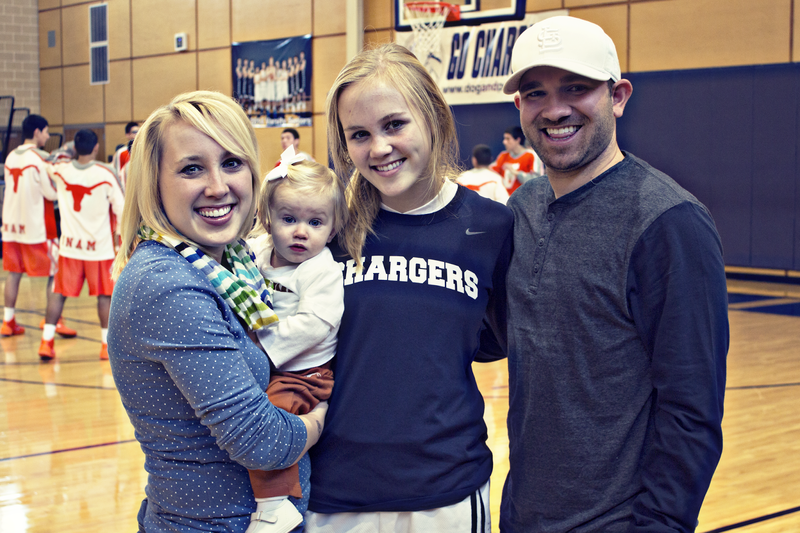 When JD and I visited Texas this last Christmas, we got to watch my 15 year-old sister, Morgan, play basketball. So fun! She is so good with the ball! She is very obviously gifted as an athlete and has such passion for the game. I love watching her emotions while she plays- her frustration with referees, her aggression towards opponents, her pride when she's done something well, her encouragement for her teammates, her anger towards a particularly dirty-playing competitor, her excitement when the game is on the line. She was bouncing between the JV and Varsity teams when we were there, but she's since been moved up to Varsity. I am proud of her for sticking it out when she wanted to quit. I am proud of her for pushing herself and her limits. It's been really fun for me to watch (from a very obvious distance) as she's progressed in the sport. I love hearing my parents re-cap her games to me. 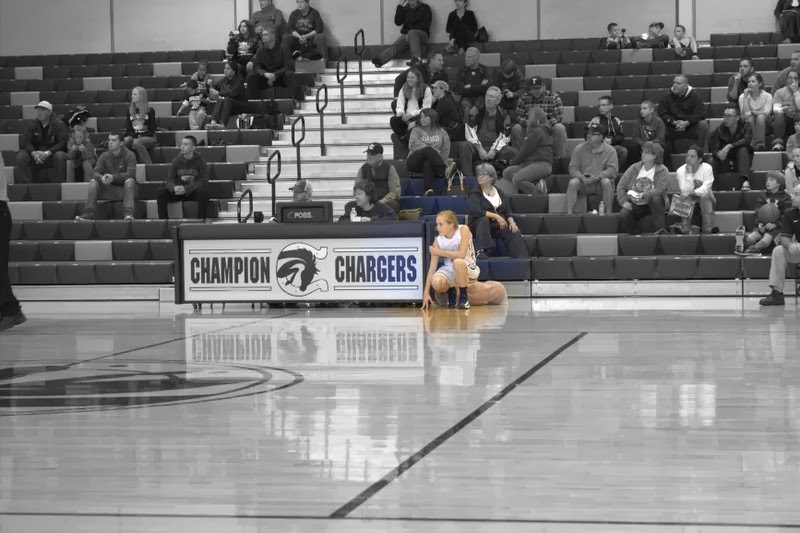 I love when I get to be there to see her play. I love listening to my Grandpa brag about her abilities. Morg, you are unmistakably the hot-shot I was not. Keep it up, girl! P.S. Love you so much. and it ended up mostly about me. . . oops. It is my blog, right? !